As early as 1623, it was noted that British colonists were bringing the White Mulberry and the silk worm to Virginia, encouraged by King James I of England (Regni, 2003). In Britain, the silk industry had been mediocre for its economy. The King was counting on the silk industry to renew itself in the colonies and contribute to Britain’s wealth. Unfortunately, it was cotton and tobacco that succeeded, not the silk industry, as more profitable businesses (Rafinesque, 1839). The silk industry was less than meager until it was reinvigorated in the 1760s by a tree nursery owner, Nathin Aspinwald (Field, 2007). Aspinwald brought the Morus alba to his native state of Connecticut and began a silk farm and jumpstarted a spinning industry. From other various northern states, the silk industry began to take hold (Regni, 2003). By the 1830s, there were experts on the subject and entrepreneurs who would inquire to their governors or local townships in the hopes of spreading the word of this profitable industry. There were numerous books written on the cultivation of both the White Mulberry and the production of silk, so much so that one can note energetic pleas to foster the production of silk as a kind of patriotic endeavor. It was the advent of the water powered silk mill, around the 1850s, that also gave another boost to the silk industry (Field, 2007). Former Massachusetts citizen J.H. Cobb, who privately manufactured silk and a fervent supporter of the industry, noted the 7 million dollars worth of silk consumed by the United States by the year 1831 (Cobb, 1833). It was believed that silk was “as easy to derive from trees as harp and flax,” as Rafinesque, a Philadelphia native wrote. He went on to say that it would fulfill the “patriotic wishes” of politicians to make “northern states” become “natural producers” of silk along with other tree products. Indeed, there were many arguments for the presence of America’s own silk industry. 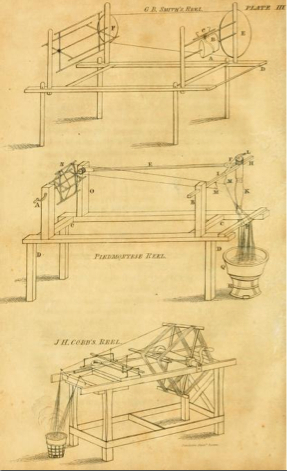 The industrial revolution was well on its way when private silk growers were publishing manuals on the cultivation of Mulberry trees and the subsequent silk making process. As a country on its own, there were many Americans who believed in the power of the silk industry to further produce an economic powerhouse out of the United States. Author and private silk grower William Kenrick wrote with excitement in 1835 about the possibilities of the silk industry, advocating for the “introduction of a culture, which may make rich the people, even of the less fertile districts, and open to our country the resources of unceasing wealth” (Kenrick, 1835). Cobb was a man of his time, who wrote that the job of harvesting and producing silk “is an employment, in which females and children may be honorably and profitably engaged” (Cobb, 1833). Cobb and others urged for an industry that would include women and children as its primary work forces. Providing further support, the Committee of Agriculture from the House of Representatives advocated for the industry, saying it was a culture “worthy of legislative attention.” Therefore, they concluded to have the secretary of Treasury to prepare an extensive manual on the proper cultivation of the Mulberry and its subsequent silk produce (Field, 2007). In 1842, the competition among states for silk production was primarily between Pennsylvania, Connecticut, and Rhode Island who each produced roughly more than 10,000 pounds worth of silk cocoons. Vermont produced the second greatest quantity of silk cocoons, being 5000-10000 pounds worth (Marsh, 2012). By the late 1800s, much of the silk industry was generated from Paterson, New Jersey after some cotton mills began producing silk ribbons. It was therefore deemed “Silk City”. Following alongside the Industrial Revolution, the silk industry was met with greater demand with the invention of the spinning machine. 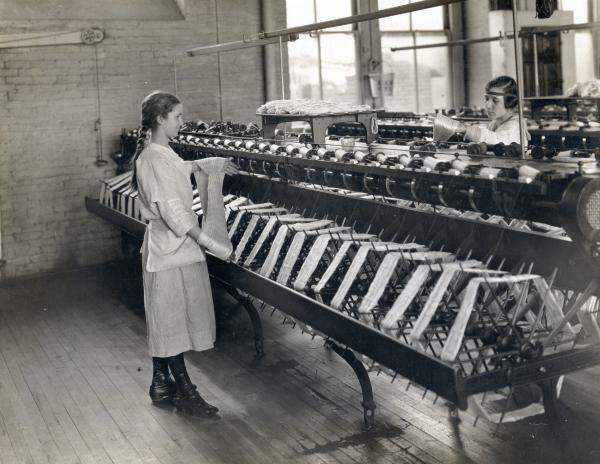 In 1905, the machine had usurped the place of the handloom, and the United States could compete with the European silk industry (Field, 2007). One of the longtime leading competitors had been France, and the need for their exports fell drastically, with the rise of the United States’ technologically reinvigorated industry. There was a brief stint of economic success in the silk industry until the Depression. Just as all other industries had declined, the silk industry also lost much of its gusto. At the same time, there was a great demand for at least raw-silk which was imported from China and Japan to be refined in the United States, supporting foreign silk markets (Ma, 1996). For the rest of the 20th century, the American silk industry was outcompeted by China and Japan (Regni, 2003).